This has been one of those strange weeks where nothing has gone as planned but has ended up in the right place. Through some strange alignment of the planets, I’ve ended up with the beta of Comcast’s myDVR, which lets you schedule recordings on the web (and a whole lot more) through Fancast on your Comcast DVR. Comcast has had an iPod app for a while, and updated the version yesterday to be more iPad friendly (yes, push now works for notifications). Most markets don’t have this rolled out yet. 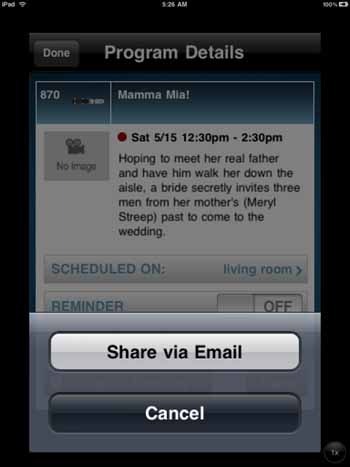 And no, this is not the app Brian Roberts showed off at the Cable Show this week for the iPad. 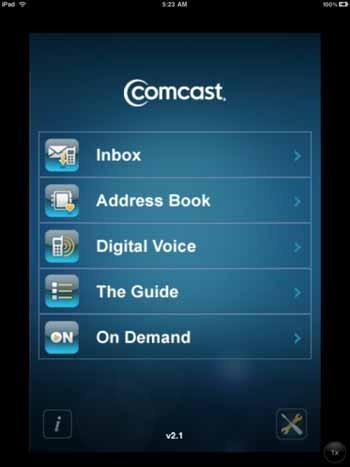 The Comcast App does more than Video, it does email, voicemail, and on the iPad, this is quite usable for me. First, I went to http://www.fancast.com to activate the myDVR application. Since I’ve used the Fancast site before, I’d already specified my channel lineup. To get to the schedule, just tap The Guide. The Guide is very readable on the iPad, and of course you can rotate the iPad for a landscape view. You can select several predefined views within the app, but I find it best for me to use the Favorites list that I created on the iPad. Anything previously scheduled will show as a red dot. And you can select a scheduled show to make changes from this screen. 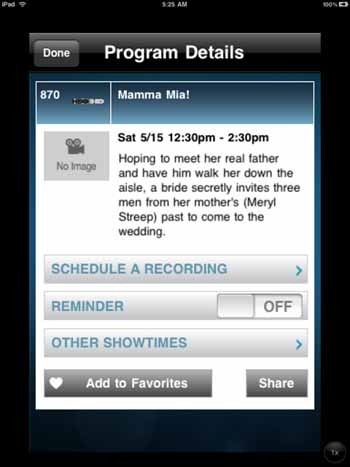 I’ve scrolled on to the next day and decided to record Mamma Mia. I can schedule, set reminders and view other show times. 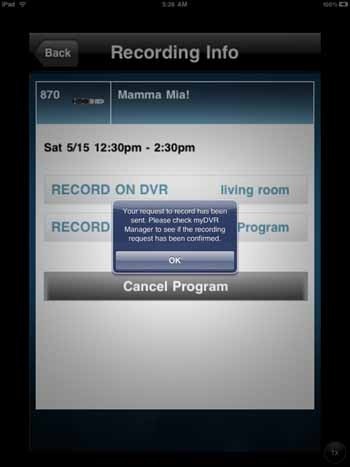 If I want to change to my other DVR, I just tap Record On DVR and can make the change. And I can record on both if I so desire. Once I’ve decided to record, I get a message indicating that the request has been sent to the DVR. As promised, when I view the guide on the iPad, within a few minutes, I can see that it is a confirmed recording. If I select the show, I can make changes. And if it is a show/movie/series (yes I can setup series recordings too) that I want to tell someone else about, Comcast provides a link that opens an email message, pre-populated, with the summary above for you to address, maybe add a few comments, and send. All in all, this is really slick. 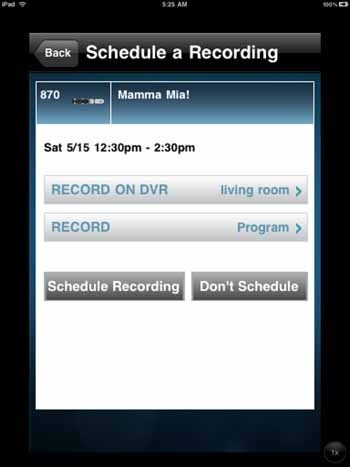 Far better than scheduling on the actual DVR (in my opinion). I don’t know when it will be available in various Comcast markets, but it is slowly getting rolled out.